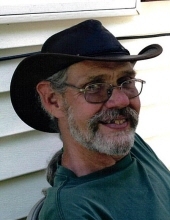 BURNHAM-Warren L. Knowlton, 69, died with his wife by his side on Tuesday, November 13, 2018, at his home in Burnham. Warren was born on November 20, 1948, in Norwalk, Connecticut, the son of the late Lawrence and Winifred (Jennings) Knowlton Sr. He graduated from Brien McMahon High School in Norwalk, Connecticut, with the class of 1966. He began his long career as a weldor and metal fabricator before rising to an ironworker foreman and superintendent. He was a music enthusiast, enjoyed reading, traveling, and riding his Kawasaki Concours. He found purpose in creating, building things from wood and metal, both practical and artistic. As the household’s resident mechanic, he was methodical, intrepid, and successful. He is survived by his wife of 47 years, Diane Knowlton of Burnham; son, Timothy Knowlton of Lexington, Kentucky; daughter, Amy King and husband Michael of Rushville, Indiana; siblings, Winifred Stroup of Parsonsfield, Lawrence Knowlton Jr and wife Laurel of Porter, Kathleen Knowlton of Richmond, Karen DuPona of Upham, North Dakota and Betsy Graveline and husband Neale of Stratford, Connecticut; and many nieces and nephews. He was predeceased by his parents; and a sister, Mary Potter. A time of visiting will be held from 2-4 p.m., Monday, November 19, 2018, at the Shorey-Nichols Funeral Home, 191 Hartland Avenue, Pittsfield. A private funeral service will be held by the family. Interment will take place in the spring at the Knowlton Cemetery in Newburgh. Should friends desire, memorial contributions may be given in Warren’s memory to the ALS Association, PO Box 37022, Boone, IA, 50037 or online at www.alsa.org. To send flowers or a remembrance gift to the family of Warren L. Knowlton, please visit our Tribute Store. "Email Address" would like to share the life celebration of Warren L. Knowlton. Click on the "link" to go to share a favorite memory or leave a condolence message for the family.